Archeologists uncovered a site near Austin, TX that pre-dates the commonly held migration by up to 2,500 years. Native Americans descended from Asian peoples that traveled across the exposed sea floor of the Bering Strait between Asia and Alaska during the last ice age. These peoples eventually traveled south when the ice began to melt, with archeological evidence found in present-day Washington state and other places supporting a date for this migration beginning around 13,000 BCE. 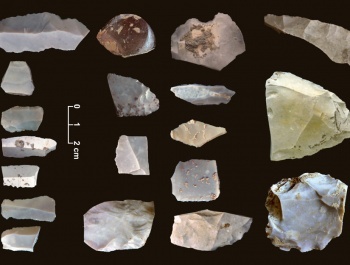 Now a new find in Texas of a campsite full of 15,528 stone artifacts has been dated between 13,200 and 15,500 BCE. 56 of those pieces are stone tools - working stones, blades, scrapers and choppers - and they were found in an 8-inch thick archeological layer beneath 5 feet of earth. The team, led by Michael R. Waters of Texas A&M University, used luminescence dating to determine when the stone artifacts were last exposed to ultraviolet light. The report by Waters, published in the March 25th issue of the prestigious Science journal, refutes the belief that big-game hunters wielding a two-sided blade called a Clovis were the first Americans. Waters said that the find was "like finding the Holy Grail." None of the tools discovered seem to have the distinct Clovis style, disproving the theory that the makers of the Clovis spears following the wooly mammoths and other large game south were the first humans in America. "From Oregon to Pennsylvania to Florida to Texas, 15,000 years ago we've got people all over North America that were doing a lot of things," Waters said. Other archaeologists are skeptical of the find. Tom D. Dillehay from Vanderbilt University, isn't sure that the layers Waters' team exposed are distinct. He thinks that the separation "appears not to be as clear as the authors would have us believe." Even if true, Dillehay doesn't see the significance. "What's the big fuss?" he said. "The Clovis First thing has been dead for a good 10 years. This is just another site that confirms what's been known about other areas of the new world." It's really fascinating to study this part of human history because it marks the transition from dealing with purely animal needs like food and shelter to creating art and other forms of culture that make us distinctly human. These artifacts show that humans were able to survive in a harsh land, but when did they start to paint on walls, or make music? Did the people who used these tools know they were in a new land, or did they just care about catching the next meal? Perhaps with more investigation, we'll find out more of what makes us human.